Shop here for wireless adapters that can give you the best Wi-Fi connectivity! There are few things more necessary than a fast internet connection, though it can be tough to get a good internet connection on all computers. 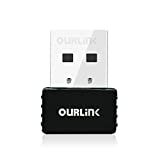 Furthermore, these technology-focused items are budget-friendly, allowing you to get a great connection just about anywhere in the world as well as at home. For an easy internet access solution for your home computer that isn't expensive, this is the place to be. USB Wi-Fi adapters are a great solution for older computers that may not have a built-in Wi-Fi connection. Whether you're playing games, browsing the web or streaming Netflix, these adapters can work for just about anyone. With the adapters on the market today, you can get your computer online in no time! There are a few things that are important to keep in mind while you shop for adapters. It's a good idea to consider the kind of speed you're looking for, as well as how many bands you'd prefer to use. In addition, knowing the kind of security you can expect is important. Lastly, knowing what kind of warranty you can expect will let you know how much the company backs the product. 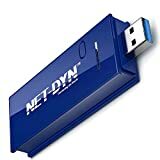 If you're hunting for an outstanding choice for both Mac and Windows computers, the Net-Dyn dual band Wi-Fi adapter is a great way to go. It's compatible with a variety of systems and can be a great tool when it comes to adding Wi-Fi capabilities to your computer. With this device, you'll get 802.11n connectivity, allowing you to reach speeds up to about 300Mbps as a result. Furthermore, the Net-Dyn is great for covering areas of around 100 yards, offering both 5GHz and 2.4GHz capabilities. Many users also find that it's a snap to set the device up. All you have to do is plug the little device into your computer, then locate the drivers and install them (Windows only). Before long, the Net-Dyn will be providing you an internet connection as well as WPA/WPA2/WEP options for connectivity to keep you safe while you browse. It's also able to be used with a variety of U.S Internet providers and WLAN routers. In addition, the Net-Dyn is truly a future-proofed purchase through the addition of a lifetime warranty. Through routine driver and software updates, you'll be able to continue reaching the fastest possible connection speeds for years to come. Because of that, the Net-Dyn is truly a fantastic option. 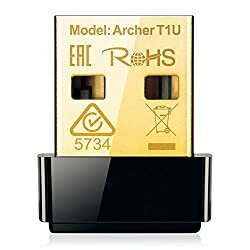 Many love this little device, but some do find that it might not work well with all operating systems or can drop the connection too often. Can sometimes drop the connection frequently. May not work efficiently with all operating systems. If you're looking for something that can give your speeds and range a bit of a boost, this is the way to go! If you're looking for an affordably-priced compact choice, try out the TP-Link T1U USB adapter. While this device does not have a 2.4GHz band, it strives to offer 433Mbps of speed on the 5GHz-only option. In fact, many find that the T1U can provide faster USB 3.0 transfer speeds than even the more expensive options out there. 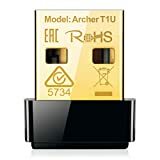 Because it is a smaller dongle, you may need to stay within a little closer range to the wired modem/router in order to get the ideal performance from the T1U. This minimal hit may effect those who want to work away from their devices, but largely isn't a problem. You'll also have access to WPA and WPA2 encryption standards as well as 64/128-bit network WEP. Due to that advanced security, you'll be able to surf online with the peace of mind that you'll be safe. Because of the plug-and-play design, many find that the T1U is incredibly easy to setup. With just a little configuration, you'll get access to great data transmission speeds, the future-proofed 802.11ac standard and the ability to work with just about any operating system. Furthermore, the T1U offers a compact size that will keep it from interfering with other ports on your computer. As a result, you'll be able to focus on enjoying your wireless online session and all the benefits offered by this handy little device. In some rare cases, customers may find that the connection with this device isn't as stable as they had hoped. It may also have more difficulty working with Linux. No wires to deal with. Can increase internet connection speeds. Can be more difficult to use with Linux. There can be some random disconnects while using this device. If you're looking for a low cost option that can really improve your internet experience, this is the device for you! While the four-antenna look on this device might seem like a little extra to some buyers, they go toward creating a fantastic range. The TRENDnet TEW-809UB adapter comes with a lot of high-end features such as great network performance, beamforming technology and the ability to handle several internet users at once. Because of the powerful antennas, multiple users can be connected at the same time without having to worry about it interfering with the connection. Furthermore, the antennas on the TEW-809UB are independently adjustable, so you'll be able to help with increasing the range in your home by fidgeting with each one. It also uses both the 802.11ac standard and 802.11n standard to provide excellent speeds. Consequently, you'll be able to get speeds of up to 1300Mbps on the former and 600Mbps on the latter. In addition, the future-proofed TEW-809UB has a range that can rival some routers that may even cost more. You can also expect that before signal degradation starts, you'll be able to get around 100 yards of distance, which is quite effective! Some may also notice that the appearance may look similar to some actual routers they've seen. Overall, you can really bank on the TEW-809UB's ability to provide you with a quality connection for years to come. It's great for at home or in the workplace, creating a lot of inclusion. It's truly a highly-capable device. While many have enjoyed the improvements this device can make, some have found that it may simply cease working or that they need to frequently uninstall and reinstall drivers. In some rare cases, the device can burn out and cease working without explanation. Some customers find they need to uninstall and reinstall drivers often to keep it working well. If you have a larger space and need an excellent range to cover that area, this is a great device to use! If you're looking for the best Wi-Fi adapter, the unique dual-winged design on the Asus USB-AC68 is surely going to meet your needs! This device is able to offer dual bands, a 5GHz band and a 2.4GHz band, which offer speeds of 1200Mbps and 600Mbps respectively. It's also made with a dual three-position external antenna pair that is able to provide enhanced reception for computers and laptops. Furthermore, the Asus USB-AC68 has a high level of portability, allowing you easy transportation while still providing outstanding speed and range. In addition, you'll have access to strong 3x4 MIMO (multiple in, multiple out) technology to ensure you are able to get through bandwidth-intensive tasks with ease. You'll also get an internal antenna for long range connectivity that can help to create extended coverage and enhanced stability. The Asus USB-AC68 has an external antenna that is foldable, so you'll be able to adjust it as needed. You'll also get some fantastic features like AiRadar and beamforming technology. 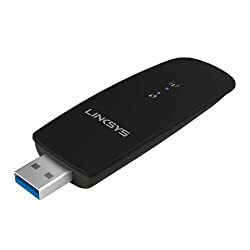 All you'll need to do is plug it into your computer using the USB 3.0 port and you'll be seeing dynamic speed increases and increased expense results in no time. Furthermore, you'll also be able to have an easy positioning option on your computer using the desktop cradle that the Asus USB-AC68 features. As a result, you'll be able to get the best signal position possible using that in combination with the antenna technologies the Asus uses. That cradle is also an excellent way to avoid the USB-only options limit on the reach through having the device out in the open. Overall, this Asus is a great option for tackling all your online needs. 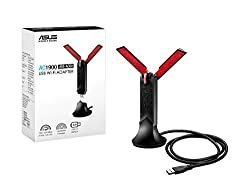 If you decide to try out this adapter, make sure to keep an eye on your connection as it can be unsteady in some circumstances. Excellent for gamers who want a lower ping. Supports two different speed options. In some cases the connection can be shaky. Some customers can have issues with installing the drivers. This adapter is a fantastic option for those who are looking for the most possible bang for your buck. If you are in need of fast gaming speeds, then the outstanding performance offered by the Linksys AC1200 WUSB6300 adapter can offer that solution! For multiplayer gaming needs, this Linksys device is able to offer two different bands, made up of the 802.11n 2.4GHz band and 802.11ac 5GHz network. These bands can get speeds of up to about 867Mbps and 300Mbps respectively. Furthermore, the Linksys WUSB6300 is made to work on Windows 10 and Windows 8 as well as Windows 7 and other Windows platforms, so you'll be covered with nearly any Windows device! You'll also get the security to match WPA, WEP and WPA2 standards alongside 128-bit encryption so you'll be able to game and browse safely. Whether you're in your office or home, this device is going to be able to handle most maximum use cases. In addition, many find that the WUSB6300 is an excellent choice for gamers as well as Hulu HD video streaming, making it a perfect choice for the whole family. For those who like their TV show binges, the 1200Mbps max speed is also ideal for Netflix and other streaming programs. Consequently, this Linksys device also works with most 802.11ac routers, extenders and access points, offering many options for support! When it comes to gaming, many have found that this adapter outperforms many others! There can be some issues with the signal dropping too often or the speed not being boosted enough to suit the needs of some customers. May work when other options don’t. Some customers may not experience the speed boosts they expect. The signal can sometimes be unstable. If you need something that can help with decreasing your gaming ping times, this is a fantastic option! The Glam Hobby AC600 Wi-Fi dongle is a great option for those who want to browse the web, hosts online video conferences and stream video at decent speeds. 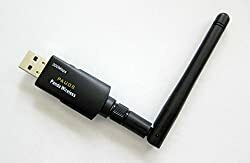 Many who use this device find that compared to Wireless N adapters with similar pricing, it's capable of running up to 3x faster. It's also able to support both Mac OS and Windows 10 with a simple software download that you'll be able to find on the Glam Hobby website. In addition, the Glam Hobby AC600 offers you fantastic speed capabilities, thanks to the 433Mbps max speed (150Mbps on the 2.4GHz band) and the 5GHz band which offers 600Mbps. At a mere 22mm in length, this device is an excellent choice for a laptop or at your desk, offering great capabilities with a budget-friendly price tag in a small package. In addition, using the Glam Hobby AC600, you'll also be able to create a Wi-Fi hotspot that works well for connecting additional mobile devices without the need for a wired internet connection! From this unique feature to the 802.11 capabilities and 5GHz connection, the Glam Hobby AC600 is a great device to have as a result. For many, this adapter is a fantastic option that can keep them getting great speeds, but some may have trouble keeping it connected or may experience speed decreases. Can allow Wi-Fi for devices that are having trouble connecting on their own. Capable of boosting connection speeds. Some customers may experience speed decreases. There can be some difficulties getting it to connect properly. If you're in need of something compact that also comes at a great price, this is a wonderful device to try out. At first look, many may recognize this device as something similar to a Star Wars Death Star. However, that resemblance is about where it ends for the D-Link Systems AC1900 USB 3.0 adapter. 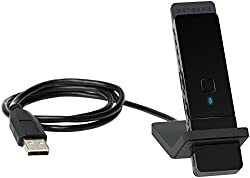 It comes with a proprietary three-foot USB cable that is able to connect to your computer easily and give you fantastic performance. The D-Link is an sphere-shaped adapter that can be compared to the size of a tennis ball or baseball, so it won't take up a lot of space on your desk. At 3.2” x 3.2” x 3.2”, it's able to offer both a 5GHz network and 2.4GHz network that allow you to get 1300Mbps of performance and 600Mbps speeds respectively. It also uses a new, improved form of beamforming technology in the form of advanced D-Link's SmartBeam. Aside from the awesome design, the D-Link uses 802.11/n/g/a networks and backwards compatible technology to help with improving your overall coverage. It's also going to help with directing your network signal straight from the router and into the DWA-192 adapter. Using the USB 3.0 transfer mode, you'll be able to transfer data up to 10x faster than the standard USB 2.0 performance. Due to the flexible technology and convenience size-wise, the D-Link is well worth the cost. It may be a little on the pricey side, but the D-Link is an overall great device. There can be some issues in which there are no changes to speed, the connection can be unstable or it may cease working altogether, though that is a very rare problem. Gives internet speeds a boost. Works well with Windows 10. Helps to create a more stable connection. Some customers may not notice a difference in speed. In some cases, it can cease working without apparent cause. If you want something that can help with speeds and also has an interesting look, this is the way to go! 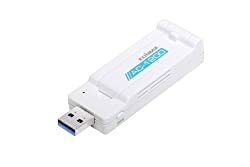 For those who need a little extra Wi-Fi connectivity, this USB Wi-Fi adapter made by EDIMAX is a great option. This adapter takes up little space, so you won't need to worry about it becoming an ugly sore thumb. It also offers a decent amount of security including WPA2, WPA and WEP64 and 802.11x encryption levels that will keep you protected while you browse. With this little device, you'll be able to get 5GHz of speed at 433Mbps due to the fantastic 802.11c connectivity. For those who use Mac, there's also an efficient plug-and-play design, allowing you to just use an easy setup wizard and you'll be running in no time. Furthermore, you'll be able to trust that this device is held up to the industry standard, keeping you secure. In addition, you can expect modern Macbook Wi-Fi protocol in a tiny 1.2-inch long device. 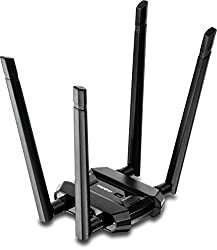 It's also going to be able to help with boosting transfer speeds, add to your Wi-Fi connection and ensure you have no interruptions. You'll have no problem connecting to your network, enjoying the 5GHz transmission frequency as well as interference-free connectivity. The abilities on this adapter also translate into an easier time connecting to your computer, using decent transfer data and streaming, browsing and more with no hassle or noise. There can be some issues with getting this adapter installed, due to drivers that may not work as they should. Works with several Windows generations. Some of the drivers needed can be glitchy. Customers can have trouble getting it installed. If you're looking for something compact that is made to work well with both Mac and Windows, this is a great option. For those who are just in need of a standard 802.11n connection, the Netgear N300 is able to offer speeds up to 300Mbps. While it may not offer the intense speeds of a 5GHz band, the 2.4GHz frequency band is more than enough for just about all of the basic operations. You'll also have the protection of the WPAS and WEP encryption characters to keep you safe. Furthermore, the Netgear N300 is compatible with Linux, Mac OSX and Windows, making it a premium choice for just about any computer and network. Largely, the features on this Wi-Fi adapter fit what most people would expect. However, there is an extra feature in that you can plug the Netgear N300 into your laptop using an extension wire, allowing you to use it as an antenna that can help with improving your signal. Aside from that, you can also use it in the standard fashion through plugging it into the thumb drive directly. Because of these use methods, you can take the Netgear N300 out with you for on-the-go Wi-Fi compatibility or just use it at home to help with increasing your signal as you work at your desk. Due to the compact nature, you can easily take the stand doc with you by tossing it into your laptop bag. Overall, this is truly a device with some excellent functions, which make it more versatile than other options in this list. So if you're looking for something that has the ability to help you in multiple places, this is definitely the device to look for! Whether you're using it in the USB slot or upright, it gets the job done. If you are a Linux user, then this may not be the ideal option for you. Users have found that the drivers needed to install it for Linux can be tough to find. Helps older computers to connect to your network more easily. Some customers can have trouble getting it to stay connected. Customers may find there are no drivers for using it with Linux. If you don't mind splurging on something with a lot of capabilities, this is a fantastic option for you! Combining stellar performance with a fantastic price tag, it's hard to go wrong with the Panda Wireless PAU06. This device is compatible on several operating systems, including Linux systems as well as Mac OS and Windows 10. It also comes close to offering a 5-star rating on Amazon due to the simple, future-friendly design. Furthermore, The Panda PAU06 is able to make use of a 1.4GHz band and offer speeds of up to 300Mbps. The Panda is capable of backwards compatibility with 802.11g networks as well as the more modern 802.11n standard. Because of these abilities, it's going to be able to ensure a more stable connection with just about any internet service provider out there. For added safety, it's help up to WPA and WPA2 encryption standard as well as 128bit WEP security standards. Using low power technology, the Panda PAU06 is able to work in the background, keeping it from using up too much of your laptop's battery. It also offers a WPS button that will make it easier to connect the device to your computer. Users also find it to be quite easy to use, and are often pleased with the max data rate it is able to reach. From the versatile compatibility, to the sturdy connection it offers there's really no reason to not be upgrading to this device. It can really help your computer to reach upward to higher speeds than you may have known before, and it does so while using minimal battery. Overall, most users have found this to be a truly useful tool. While many enjoy the benefits this device can offer, some can have trouble getting it installed or find that it suddenly ceases working without apparent cause. Convenient plug-and-play design for those who use Windows 7, 8 and 10. Some customers can have trouble getting it installed. In some cases, it can cease working without apparent explanation. Another great option for those who want something with a lot of capability at a decent price, the Panda adapter is a fantastic way to go.